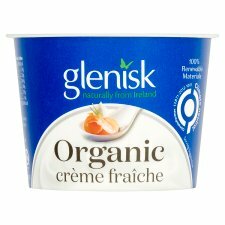 Our Crème Fraiche is crafted using a blend of Ireland's best Organic Wholemilk and Organic Fresh Cream, cultured to perfection over time to create a distinctive and delicious flavour. Ideal for soups, sauces, dips, dressings and toppings, Crème Fraiche enhances any dish, sweet or savoury. With much less than a third of the fat of mayonnaise, and free from any artificial ingredients, it's a tasty, healthy choice that brings good food to life.